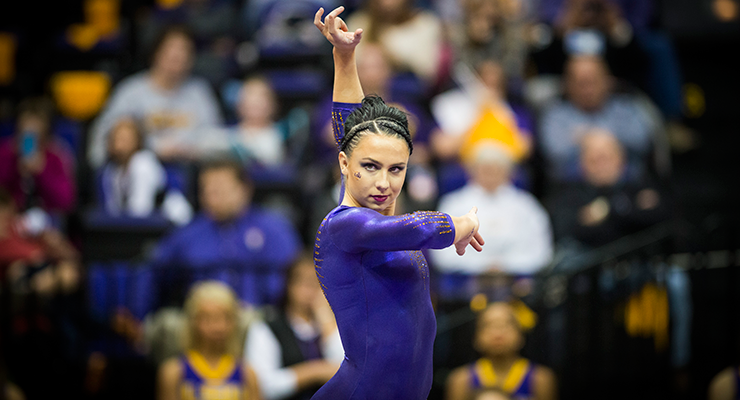 LSU’s Rheagan Courville, The Tigress of the Bayou. The secret to the height and consistency of her standing Arabian on beam. How University of Georgia emigre, coach Jay Clark, has improve her bars about a billion percent from her elite days. Cardio secrets of the indefatigable LSU floor lineup. How her positive and negative experiences in the sport fuel her gymnastics now. Future plans, skills she’s hiding up her sleeve and her love for Louisiana. Fashion: What did Miley Cyrus tell Rheagan about her style and will she be able to up Jay Clark’s shoe game? Brenna Dowell: her perspective college vs. elite gymnastics, skill strategy, transition of normal human life and her crib tour! We were shocked to find out they consider themselves the underdogs and see K.J. so intimately involved in the technical aspects of coaching. How important are the rankings, does seeding really matter? Do teams switch ranking order in the post-season or have training plans been mastered to keep injuries at bay? Vault Gate — when the injury substitution rule can be too easily manipulated. Oklahoma are concurrent champions in both men’s and women’s gymnastics right now. The men’s stick bonus allows each team to carry around a gigantic eraser and get rid of mistakes. Stanford’s Sean Senters did the TRIPLE TWISTING YURCHENKO! 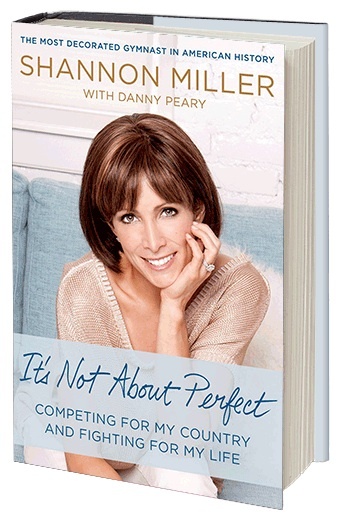 Who: Shannon freaking Miller will be our May Book Club guest. Deadline: Send in questions by May 6th. This is how boys salute when they win an NCAA Championships. GymCastic stamp of approval. Thank you Kristen at Fantasy Gymnastics for these gifs! Oyama doesn’t need to salute, he incites a riot instead with his stickage. Thanks so much for the Oklahoma coverage today. The dorms are spectacular and new. I rather like that the Dean of the College of Arts and Sciences lives there with them and is a bit supporter of the women’s gym team too. As you probably know, sports are big and well-funded at OU. Hypothetically, extra funding for women’s gym might help balance some title IX scales….ahem. Although, actually David Boren (the president) is a big believer in really nice buildings and facilities all throughout the campus. I was super spoiled in my time there and arrived at my graduate school to be horrified at the crappy lounges, dorms, etc.. in comparison to OU’s. (I happily work for that university now so it will remain nameless, but it does also have a women’s gymnastics team!). Anyway, I think with the new SID the promotion is improving. Other random thoughts: I’m in the background of the Squires gif which is fun. On the random 3/4 tights situation, they seem to wear those a lot when I see them out and about. For example, entire team was in them at the men’s championship meet. Probably not why they are wearing them in the video, but they do seem to be their preferred, or required, team attire a lot. Also, did you see they are sending a fan bus? That seems good for building the base– free ride to nationals! In less glamorous news, the team is also, I believe, taking a bus. OMG, you’re interviewing Shannon-freaking-Miller next month?!?! I can NOT wait!! !